Before I write anything else, let me just clarify that this blog is not actually turning into solely ‘What’s for Supper Wednesdays’…it just looks that way. The truth is that the past week has entailed both boys being sick for 4 days with a lovely virus that included 104.4 degree fevers, a long weekend on Cape Cod, my 30th birthday, and a brand new job. Mostly positive things, I can admit, but just Way. Too. Much on my plate to carve out any time to post on here. I am reigning in my life and will be posting regularly again this week. If you were extremely upset to miss my posts for a week, I apologize to you. And also would be very interested to learn more about your mental state. Because, uh, yeah. I’m really not so interesting. So, let’s move along, shall we? We have moved a LOT in the past five years. Baltimore. Washington, D.C. Maryland. Washington, D.C. Maryland. New York. I wish I could say that we got better at it with each move, but I can’t. With each move I find us unpacking items that really shouldn’t have been packed at all, but rather, put in the garbage. Torn pillow case. Empty shampoo bottle. Pile of catalogs. Can of expired beans. I know. How in the world do you manage to have a can of expired beans. Well, it’s easy, really. You just cart it around with you from home to home…for many years. And never use it. Obviously. So, when we moved to New York I decided we were really, truly, honestly done with moving pure crap from state to state. And also done with keeping food in our pantry and not using it in a timely manner. What can I say? We are so anti-authority that we even disobey ourselves, I guess. Truth be told, I really wanted to organize this a bit before taking a picture. 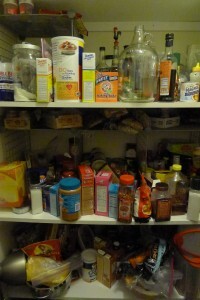 But then I reminded myself of the blog’s name and decided to show you the true state of our pantry. 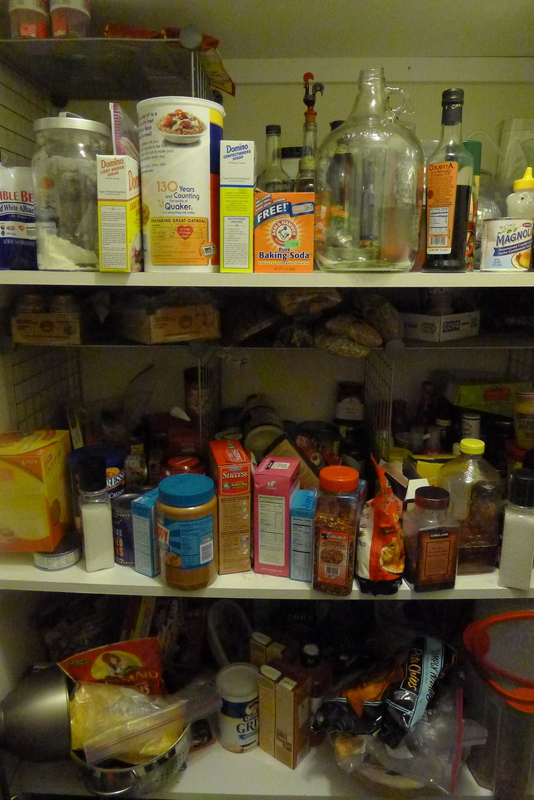 At the very least, I am (almost) 100% certain that nothing in that pantry is expired. So it isn’t worthless, there is just a LOT of it. With a large part of the problem due to a little place called Ocean State Job Lot. But that is a different post for a different day. 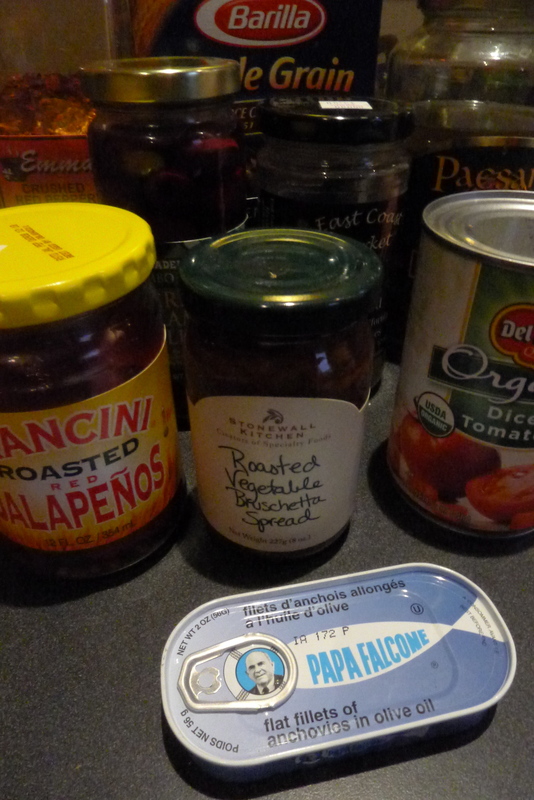 As we prepare to move again in July, I have made it my mission (alright, my husband – the one who will be lifting boxes – has made it his mission) to use up the food in the pantry before moving. Tonight, this mission was perfectly in sync with the fact that today was my first real day in my new position and a hectic day in general. This was the kind of night where I definitely couldn’t handle an hour of preparation and even 30 minutes felt like too much. No, tonight was a 10 minute meal kind of night. 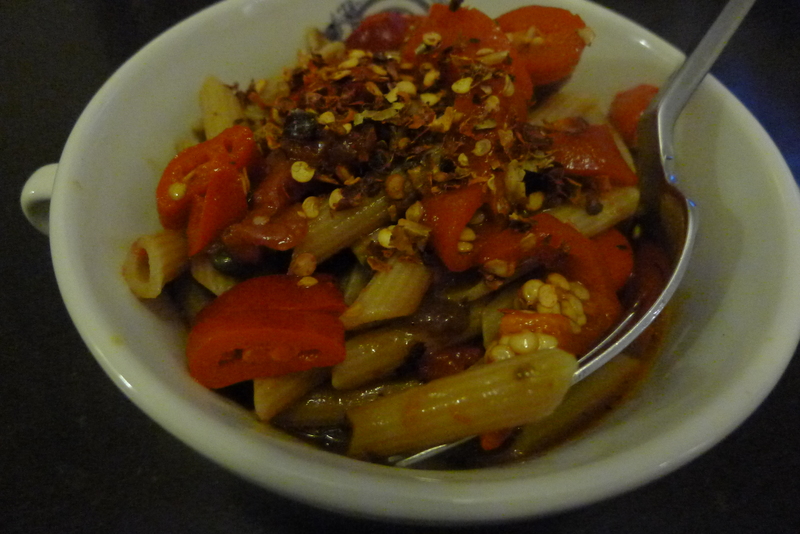 Which means that I went with my old stand by: Pantry Pasta. This is a super easy dish that will vary greatly depending on what types of items you keep in your pantry. I will give you the recipe based on what I keep in ours. 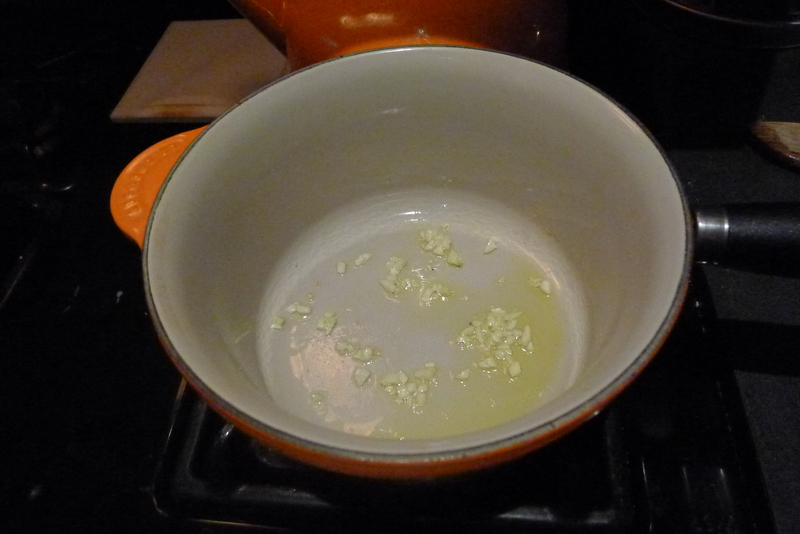 Honestly, as long as you start your sauce off with some garlic sauteed in olive oil it is pretty difficult to bring the dish in a wrong direction. Who doesn’t want to walk into a home and smell this? From there, our personal Pantry Pasta usually heads in a pretty salty, briny direction. We didn’t end up adding the anchovies…until Carlitos specifically requested the “little fishies.” I can understand if you don’t include them, though. Especially if you will be speaking to me in person within 14 hours of dinner. Also, the only one with the roasted jalapeños and pepper flakes was my husband. Only add these ingredients upon request. Otherwise it’s just mean. Please wish me luck in emptying out this pantry. And I wish you luck finding cohesive items in your pantry…and making it through whichever day it is that require that dinner only take 10 minutes to create. 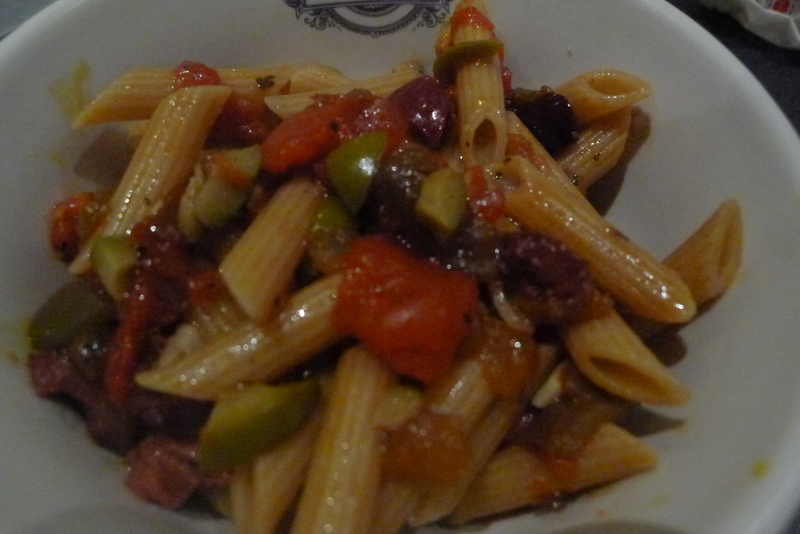 Just don’t put your mini marshmallows and your kidney beans in the same Pantry Pasta. While you would probably feel pretty outlandish, creative and ironic…you would actually just be silly. And gross. Boil water in a pot. Once boiling, add pasta and follow cooking instructions on the box. Drain the pasta and pour it into the sauce pot. Serve topped with spicy or fishy items, if you so desire. Have fun with it and please report back about which pantry items you used for your Pantry Pasta! This entry was posted in What's for Supper Wednesdays and tagged capers, FRUGAL, full pantry, garlic, moving, olives, Pantry Pasta, pasta, tomatoes. Bookmark the permalink. Follow any comments here with the RSS feed for this post. Post a comment or leave a trackback: Trackback URL. You are my cupboard twinsie! Well, then, you HAVE to try this recipe. It is seriously WAYYYY more delicious than it may look.